It’s going to take around three weeks to clear out the rock-solid mass. 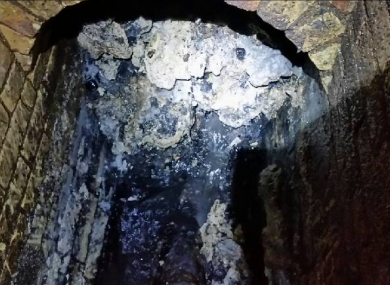 SEWAGE WORKERS HAVE found a 130-tonne ball of congealed fat – dubbed a “monster fatberg” – clogging a Victorian-era sewer in London, utility company Thames Water said Tuesday. Engineers expect it will take up to three-weeks to remove the rock-solid mass of festering food fat mixed with sanitary wipes found in drains under a major road in Whitechapel, east London. “This fatberg is up there with the biggest we’ve ever seen. It’s a total monster and taking a lot of manpower and machinery to remove as it’s set hard,” Matt Rimmer, Thames Water’s head of waste, said in a statement. “It’s basically like trying to break up concrete. It’s frustrating as these situations are totally avoidable and caused by fat, oil and grease being washed down sinks and wipes flushed down the loo,” he added. Images show that the sewer totally blocked by the 250-metre long fatberg. An eight-member crew is removing an average of 20 to 30 tonnes a day, the statement explained, using high-powered jet hoses to break up the mass which is then sucked out into tankers. Weighing the same as 11 double-decker buses, the fatberg easily eclipses the one found in 2013 in Kingston, southwest London. Described at the time as Britain’s biggest ever fatberg, it weighed 15 tonnes and took ten days to clear up. Thames Water clears up an average of three fat related blockages and five blockages caused by items including wet wipes every hour from its sewers in London and the Thames Valley. It costs the company around €1.1 million a month to do so. Email “A 130-tonne 'monster fatberg' is clogging up London sewers ”. Feedback on “A 130-tonne 'monster fatberg' is clogging up London sewers ”.